Toxic metals/metalloids are considered leading environmental contaminants for world agriculture. Metal/metalloid pollution in the crop growing area increases their accumulation in plant as well as facilitates entry of them into the human food cycle. Recently it is gaining enormous research interest as it limits crop production by harshly altering the physiology and biochemistry of plant. 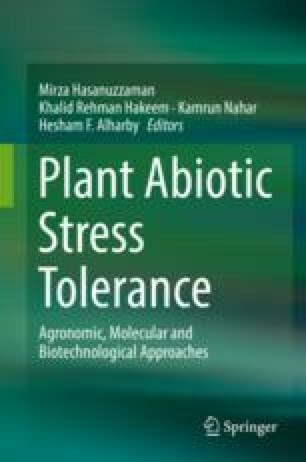 Metal/metalloid-induced stress reduces rate of photosynthesis, enhances generation of reactive oxygen species (ROS), increases methylglyoxal (MG) content and consequently causes oxidative stress, which is also accountable for overall growth reduction of plant. Plants have well-structured antioxidant defense and glyoxalase system at the cellular level to minimize the metal/metalloid toxicity. Beside these, different osmolytes and chelating agents were synthesized in plant cell to work against stress. So, effective function of antioxidant defense and glyoxalase systems against ROS and MG, improvement of osmolytes synthesis and production of different chelating agents under stress condition determines the tolerance capability of plants. However, the efficiency of this system varies greatly with plant genotypes and stress intensity. In this chapter, we reviewed the recent reports on different molecular approaches of metal/metalloid-induced stress tolerance strategies.